When option premiums are overpriced, and the trader believes the underlying shares will stay within a fairly narrow price range, the short strangle may be considered. This strategy has a lower potential profit than the short straddle, however it offers greater protection since the share price must move further to result in a loss. The strategy consists of the sale of a call option with a higher strike price and a put option with a lower strike price. 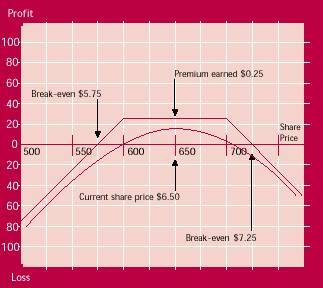 The maximum profit that can be earned from the short strangle is the premium received from the sale of the options. This will occur if the share price finishes between the two strike prices at expiry. 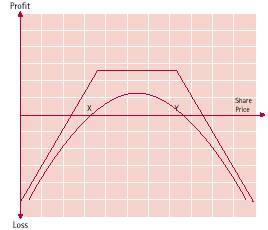 As the share price moves beyond the strike price of either option, profits decrease. A loss will result if the move is large enough to erode the premium received at the time of writing the options. Should the share price become unexpectedly volatile, the strangle writer faces potentially unlimited losses. Volatility: the strangle yields lower potential profit than the straddle because of the lower premiums received for writing out-of-the-money options. However, the strategy provides better protection against an unexpected increase in volatility in the underlying shares as the share price has to move further before the strategy incurs a loss for the writer. Time decay: as with the short straddle, the short strangle benefits from time decay. It is often best to construct this combination using options with near month expiries so as to gain the most from time decay. Risk of exercise: as the strangle is constructed using out-of-the-money options, there is lower risk of early exercise than for the straddle. However, a dramatic change in the share price can bring one of the options into-the-money thereby introducing the risk of exercise. Taking protection: the option trader may choose to limit potential losses by purchasing protection. Taking a call and a put, both of which are further out-of-the-money than the written options, places a ceiling on losses. While the cost of taking these options reduces potential profit it may be worthwhile for the conservative investor. By taking protection, the short strangle is transformed into another strategy known as a long condor. If the share price stays within a narrow band as expected, the position may be maintained until near expiry in order to gain the maximum benefits from time decay. If the share price makes an unexpected move, the trader should consider closing out the option which is in danger of being exercised. Another alternative is to vary the break-even points of the strategy by rolling one of the legs up or down, thereby maintaining the strangle. The trader should always be aware that although the short strangle is a more defensive strategy than the short straddle, a sudden and extreme change in volatility can be very damaging. Because of the potential for unlimited losses, be sure that the premium received is worthy of the risk taken. Use the short strangle over the short straddle if you have any doubts about the market's neutrality. It is now July, and following a period of relatively high volatility in the price of RST Limited, option prices are high. You believe the market is about to enter a quieter phase with the stock likely to trade in a range around its current price of $6.50. However, you are unwilling to take the risk of writing a straddle over the stock in case the share price fluctuates more than expected. You decide to write a strangle.